Chinese New Year is just around the corner and for most of us working adults, that means going grocery-shopping for steamboat ingredients, preparing hundreds of dollars worth of red packets, buying new clothes, and stocking up on snacks and goodies to feed our guests. For those who don’t drive to their relatives’ places, especially if there are many homes to visit, it can be an expensive affair if you decide to save time and call a cab. This CNY, Grab wants to offer more than just its simple ride-hailing and food delivery services. 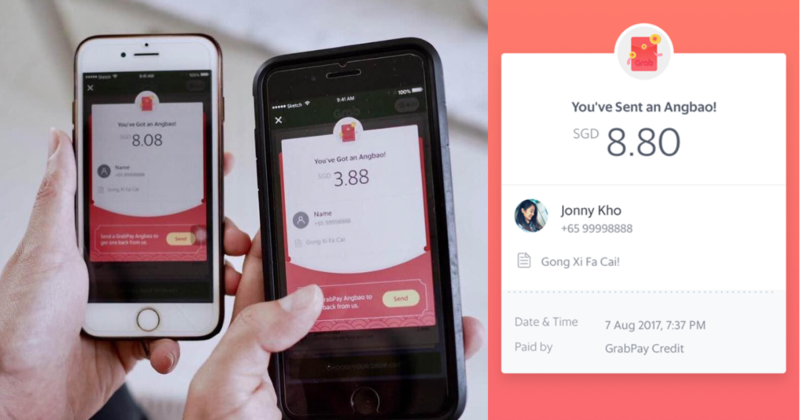 They’re bringing back their most popular feature, GrabPay Angbao, which saw more than 1.6 million e-angbaos sent in less than a week during its debut last CNY! From 4 Feb to 19 Feb 2019, users can use GrabPay to send virtual red packets to friends and families and enjoy cashback. You are guaranteed to get a bonus angbao containing GrabPay credits ranging from $0.08 to $288 when you send a GrabPay Angbao of at least $1. Each day, you can only receive eight bonus angbaos on the condition that you send to eight different recipients a day throughout the campaign. To fully maximise this cashback, this means you would have to send the e-angbao to 128 different people. Hosting the CNY gathering at your place or someone forgot to bring the Yu Sheng for lo hei? GrabFood is offering free delivery at selected eateries, including Peach Garden, Canton Paradise, Bee Cheng Hiang, Fragrance, Cedele, and more, with the promo code ‘OINK‘, valid till 19 Feb 2019. It’s always nice to spread some joy and kindness this festive period. If you and your family enjoyed the Grab ride to your grandmother’s place, you can choose to tip your driver after leaving a 5-star review. Available from 1 Feb 2019, users will be directed to a ‘Compliments’ page where they’ll have the option to tip their driver $1.68, $3.68, or $8.88. According to a Grab spokesperson, the driver-tipping feature will only be triggered if the user gives a five-star rating after a ride and users must also have chosen GrabPay as the mode of payment. Grab will review feedback for this feature before deciding whether to make it permanent. If Grab’s the only app you think you’ll be using this CNY for all your travel and food needs, you can check out GrabClub’s All-Access Pass, a monthly subscription programme for Grab rides and GrabFood. The basic All-Access Pass costs $11.99 per month and includes 20 vouchers for 20% off GrabShare rides and free GrabFood delivery for 30 orders, among others. But if you’re just using it to get to seven other aunties’ homes or hosting all of them and your cousins at your home over a few days, you can choose to get the Short Commute Lite Plan that gives $4 off 10 rides for $19 a month or the GrabFood Free Delivery Subscription Plan for 30 orders at $7.99 a month. You can view the full list of Grab’s subscription plans for yourself and pick what works best for you. Here’s wishing everyone a bountiful and happy Chinese New Year!